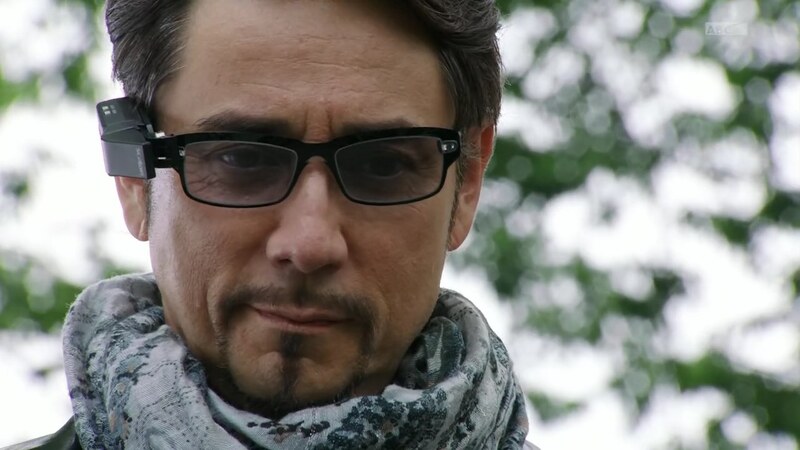 Recap: Kamen Rider Drive, Episode 39 – Where Will the Whirlwind Kidnapper Strike Next? 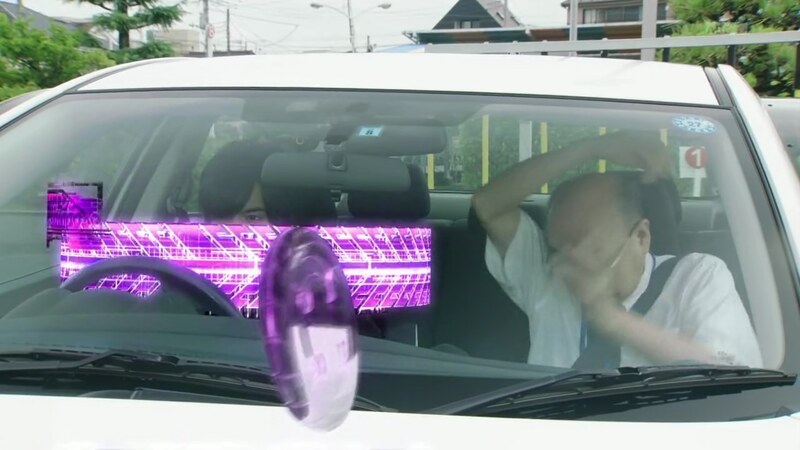 Roidmude 008 is abducting women who are with their boyfriends driving around in cars. Gou is too late to the site of the latest one. Shinnosuke and the police are even later. Shinnosuke wonders about 008’s reasons for the kidnappings, but Gou says who cares. All they need to do is destroy the Roidmude and be done with it. Shinnosuke seems a little more sympathetic as some Roidmude act on human impulse. They head back to the SID and decide to go undercover. Rinna and Otta will pretend to be a couple while Shinnosuke and Kiriko do the same. Gou wants to help too, but Chase says he can’t because his driver’s license is only for motorcycles. 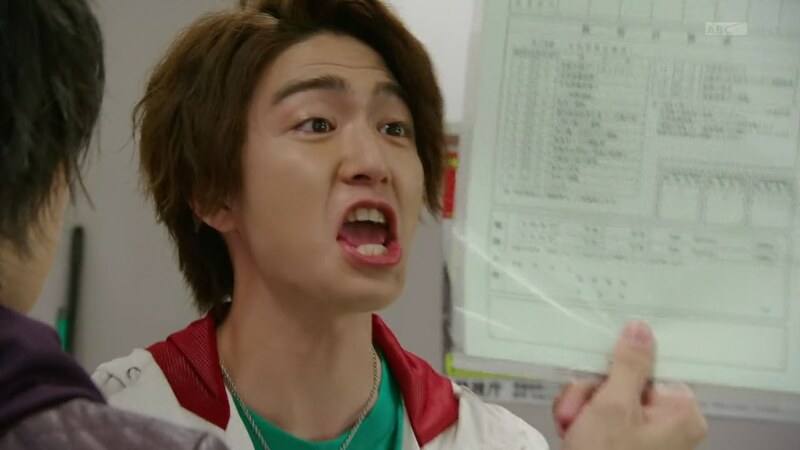 Gou says Chase doesn’t have a vehicle driver’s license either. But that’s why Chase is going to take a driver’s license test. Chief Jun says they’ve worked out an exception to have Chase do both the written and practical exam at the same time. They can work that out for Gou too if he wants. Over in a dark museum, Heart tells Medic to quickly revive Brain so they can gather the Promised Number. 008 aka Tornado reports to Heart. 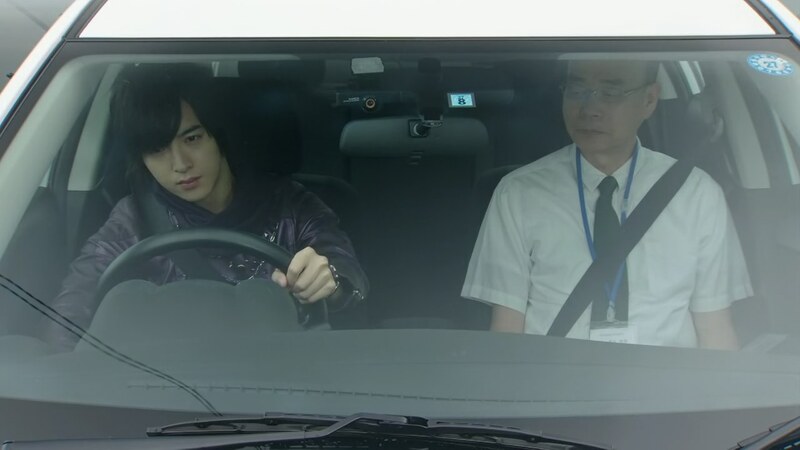 Gou watches as Chase starts his behind the wheel exam. He wonders why Chase is so excited about it. Belt-san says it should be a good thing Chase is wanting to do more human things. Anyway, Belt-san asks Gou about a certain scientist he might be holding onto. Gou comes clean. He takes his tablet father out and shows Belt-san. Gou proposes they work together, but Belt-san will have none of that. 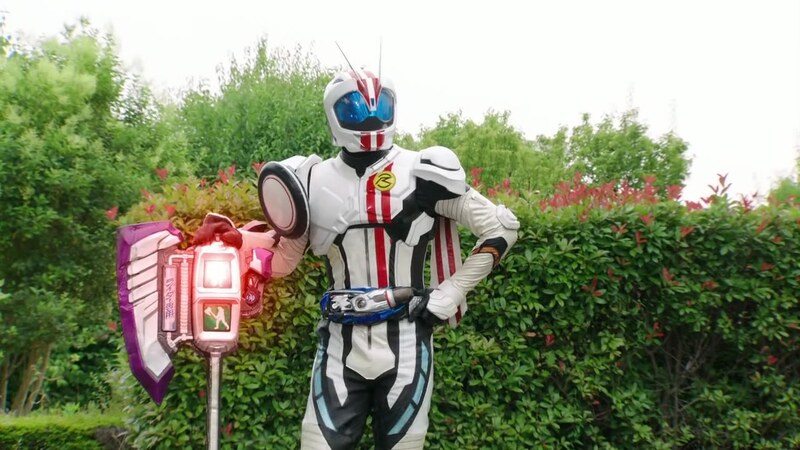 If Banno exists in this form, it must mean he stole Belt-san’s belt system. 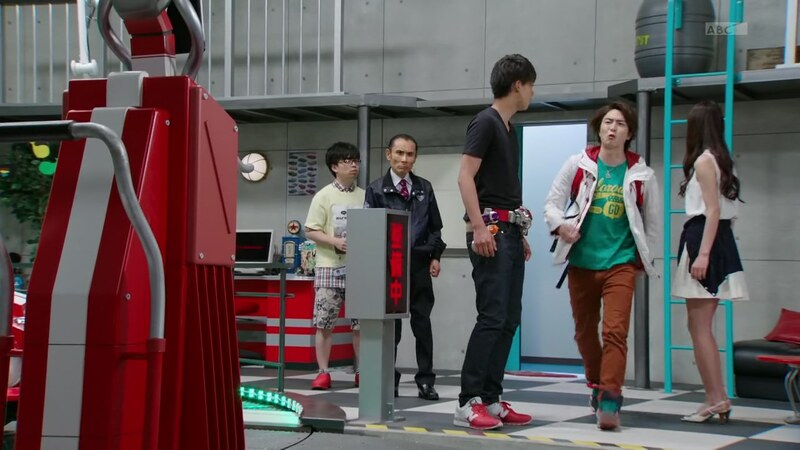 Banno tries to apologize so they can move forward, but Belt-san refuses. Suddenly, Otta and Rinna are attacked by Tornado. Before Gou can hurry over, 006 appears. Gou puts his tablet father back into his backpack and henshins. As Gou fights, Banno says this is good timing. Chase sees Gou fighting and spins the car back and into a parking spot. He excuses himself from the test for a moment and henshins right in the car. Tornado grabs Rinna. Otta tries to help, but just gets thrown into the bushes. Tornado looks Rinna over and determines she is “no good.” Rinna takes offense. 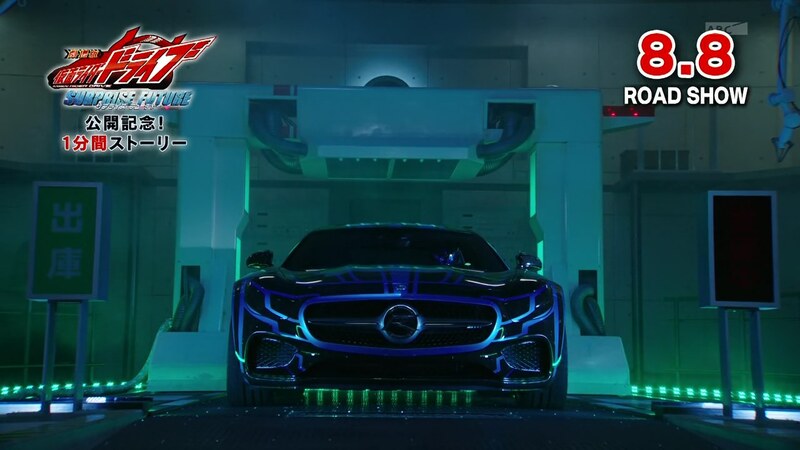 Shinnosuke arrives and Tornado goes evolved form. He asks Tornado why he only targets women. Tornado says a plain, average guy like Shinnosuke wouldn’t understand. Shinnosuke takes offense and gets ready to henshin. Belt-san suggests Formula. Tornado is able to overcome Formula’s power so they decide to go Tridoron. Belt-san takes the reins and uses a tire mix. When that manages to counter Tornado, he decides to retreat and focus on his ultimate evolution instead. Dark Krim watches the whole thing. Meanwhile, Chase hogs the spotlight from Gou as he finishes off the three low-level Roidmude on his own. 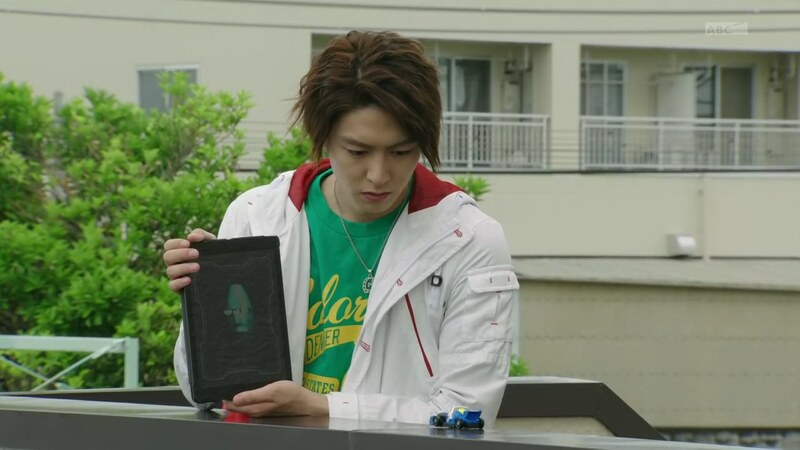 Gou hurries back to his bag and finds his tablet father is gone. Chase returns to his driving test. At the SID, Rinna is still fuming about being called “no good.” Kyu has found the human 008 is based on; George Shirogane, a fashion designer who wanders around the world. Belt-san suggests they go to The Pit to research some more. They find someone is using their equipment. It’s Banno! Banno says it’s nice to finally meet Shinnosuke. Just then, Gou comes running in calling for his father. Oops! Banno says it’s time everyone knew. Banno introduces himself as the creator of the Roidmude… and Kiriko and Gou’s father. Across town, Heart visits Tornado who has three unconscious women on the floor. Heart offers to act as his bodyguard for now since they need two more for the Promised Number. 008 and 006 are the best candidates since 004 has gone missing. Gou apologizes to Kiriko for keeping this a secret so long and explains why. Chief Jun asks Banno why the Roidmude didn’t just erase him if he’s only a mass of data. Banno says they probably need him after they’ve taken over the world. Banno speaks to Shinnosuke directly, then, and tells him he’s found 008’s hideout by scouring the internet and doing his own analysis. Shinnosuke says they’ll go investigate the location for now. On the way, Shinnosuke asks Kiriko how she’s doing. She says she’s just confused about everything. Belt-san apologizes for being too emotional and not considering Kiriko and Gou’s feelings earlier. Shinnosuke says he doesn’t necessarily trust Banno since all mad scientists are pretty shady. (Hello Belt-san!) But he does trust Belt-san’s feelings toward Banno. So they’ll just have to wait and see. Shinnosuke, Kiriko and Gou arrive at the hideout and find the women. As well as Heart and Tornado. Tornado says none of these women will bring about his Ultimate Evolution. Heart and Tornado go Roidmude form and Shinnosuke and Gou henshin to Tridoron and Dead Heat. They take their fight to the cliffs. Gou leaves Tornado to help Shin-niisan against Heart. They give Heart everything they’ve got, but they don’t even leave a scratch. Suddenly, Tornado has Kiriko whom he’s taken a liking to and can use. 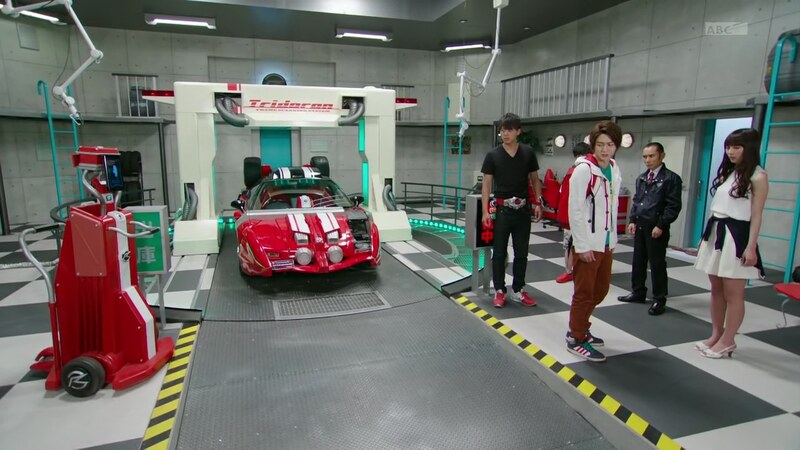 They spin away when the Ride Booster just as suddenly appears and attacks… Shinnosuke and Gou! In the driver’s seat is… Banno! Banno fires at them again and Shinnosuke falls over the cliff. Heart takes on Gou. 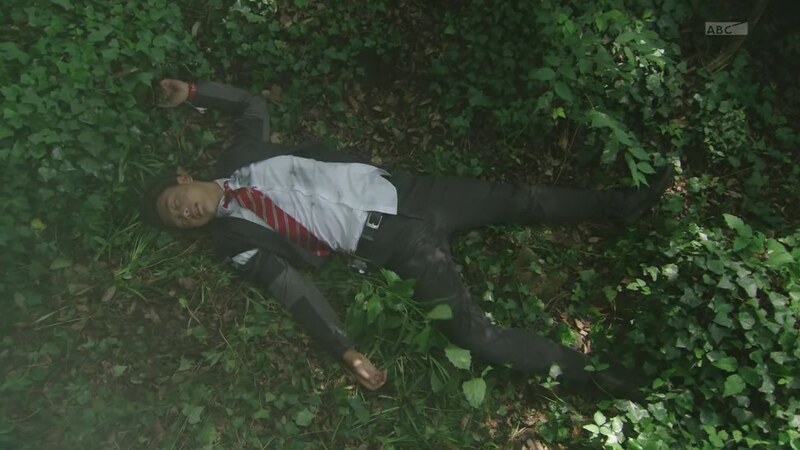 Shinnosuke regains consciousness somewhere in the forest when a Roidmude approaches and grabs Belt-san. This is Roidmude 004! Meanwhile in 2035, Tomari Eiji recounts how Krim Steinbelt has revealed his true intentions and sided with the Roidmude to take over the world. Eiji is the only human left fighting and the only thing he can do to stop this is to go back in time. Over in a darkened Pit, a dark Belt-san seems to be giving a dark Drive orders to go back in time to July 2015 to when Krim was taken by the Roidmude. But this dark Drive must kill Eiji to keep the past from being changed. These one minute Surprise Drive minisodes have been much more interesting than whatever’s happened on the actual show these last few months. Anyway, that was a completely anticlimactic reveal. 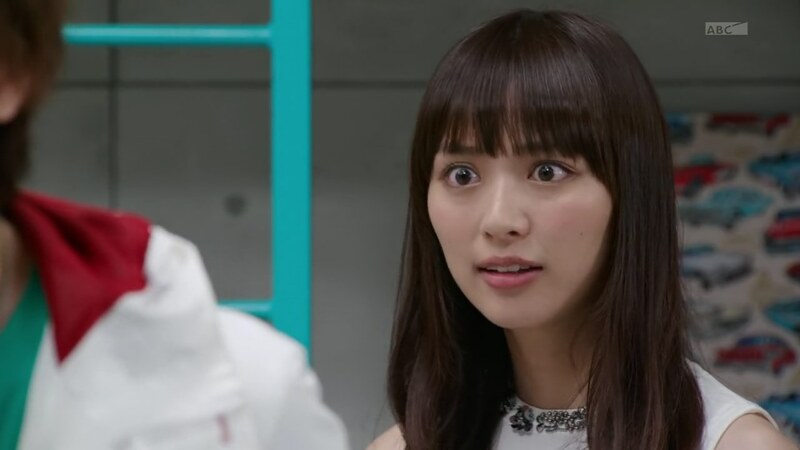 The only hope for the whole Banno in a Tablet story was some big fallout from Kiriko finding out and Gou keeping a secret. But the reveal ended up being some throwaway line which is really not a big surprise after everything else this season. 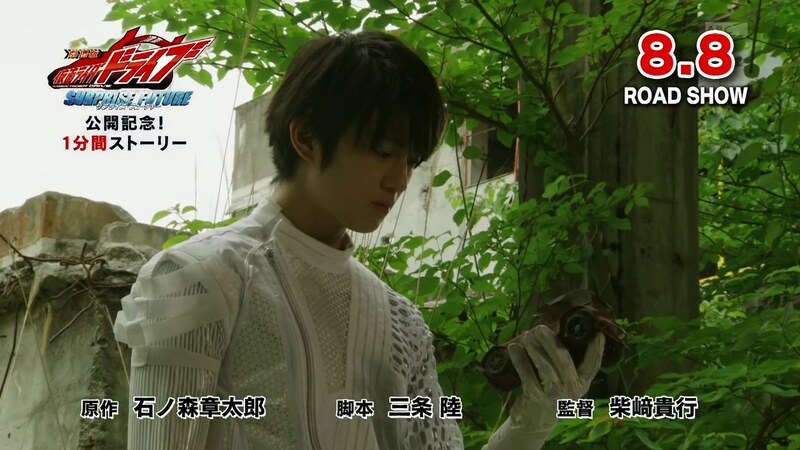 Though the preview for next episode apparently reveals Banno is the big bad (or something), I really can’t see any possible revelation that can be worthy of being a big twist. At least, nothing that can redeem the haphazard story development this season. Plus, they’re pretty much throwing Gou under the bus again for believing in his tablet father who is apparently not the reformed hard drive he thought he was. It’s just really frustrating that even though there’s plenty of potential in the overall story of Drive, they’ve chosen to ignore all of it. It’s like they had great ideas for story arcs and character twists, but instead of crafting a good timeline, decided to throw everything into the air, let them drop into place and didn’t care if things were out of order or in random places. Yeah, this is really frustrating. Again, some parts of it feel like something that we should have gotten a long time ago. Krim’s line about Chase wanting to “get some sort of confirmation from humans” would have actually been interesting if they just, you know, actually crafted a deeper story about his growing humanization. Instead, what we got is pretty much just a one-off gag that feels like just an afterthought on the writer’s part. I am also really disappointed about where Banno being the big bad is going. Say what you want about Wizard, but at least that series actually gave the villains a lot more interesting motivation than just “destroy all humans. rule over the world”. Plus in Wizard, in addition to being more fleshed out, Medusa, Phoenix and Gremlin were all interesting and fun to watch. I think a great example of Drives weakness as a series is Form Tridoron. It gives Shinnosuke the ability to let Krim take over for a short period of time to do… NOTHING. They never even bother establishing a reason for why that would be useful, just ever so often Krim will be like ‘Let me take over for a second’, and maybe his fighting style is a little more reserved but it’s not like they imply there’s a stat change or a new power from that or anything, or that there’s really a big reason why it needs to happen. That’s kind of endemic for the whole of Drive. Stuff happens, and usually it sounds like something that could be a fun idea, but they don’t really establish it well enough. 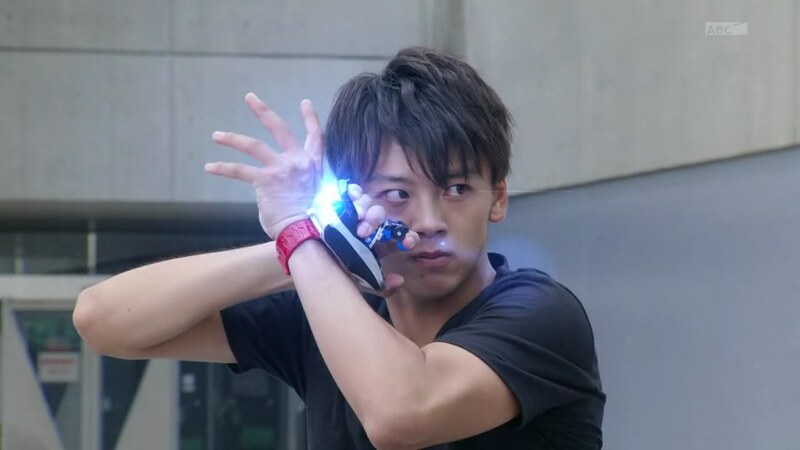 Chase is a Roidmude who wants to protect and connect with humanity. Heart is a villain whose predominant trait is that he cares about his friends conflicting with his desire for violence. Brain is an egomaniac who suffers from inferiority problems.